My name is Bob Hickey. I am a Sound Engineer. 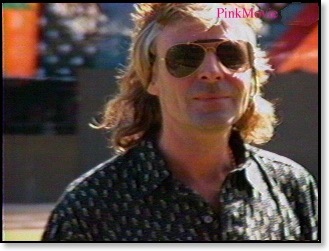 I was lucky enough and talented enough to be one of the sound mixers for Pink Floyd. 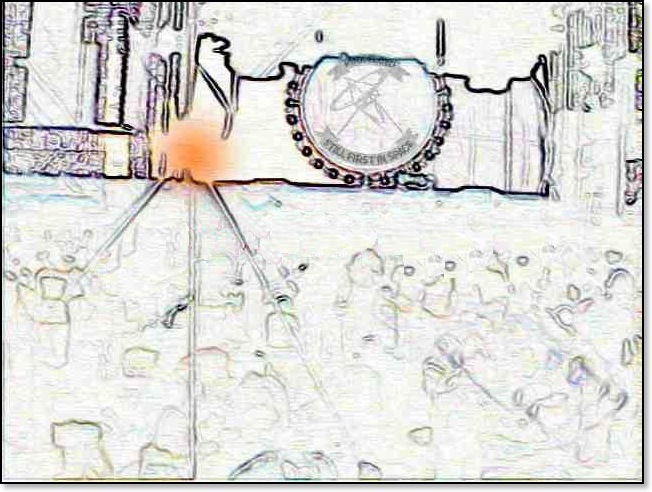 I mixed on the Momentary Lapse of Reason Tour in 1987 and 1988. I mixed over 100 shows for the band. For my own enjoyment I made home movies with a 8mm Sony V9 HandyCam Pro, while touring the world. 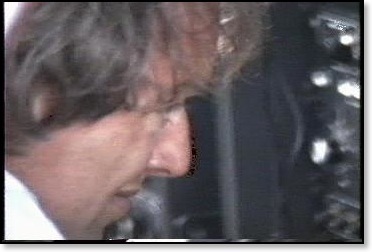 I shot many hours of video while on tour with Pink Floyd. The tapes are now edited into a two-disk DVD set. This movie is a behind the scenes look at life on the road with the world's best rock band. This movie is the endless saga of myself and my friends in the band and crew as we travel; unload; set up; test; operate; create; tear down; pack up; load out; party; travel and do it all again. So come on! As we tour planet Earth with one of the largest rock shows in the world. And people this is not two-hours of Pink Floyd in Concert. This is not interviews with the band. If you want to hear and see Pink Floyd they make lots of great products to buy. If you want to have fun and feel what it is like to work & tour with Pink Floyd then this DVD set is for you. "You did a really good job." FRED Shine On!!! From the movie, Sax and Guitarist Scott page discovers banana juice in Japan! From the movie: "You turn this little thing and it Pans the sound 'round the room. It's real fun too!" From the movie: "One of these days..."
In another clip from the movie, Mr. Nick Mason relaxes before a show. 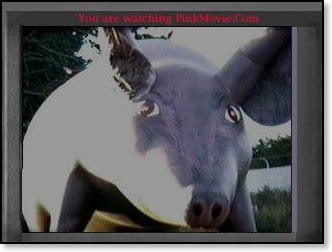 "i received you great and wonderful "pink movie.com" feature and enjoyed it very much. great shots from new zealand , australia, japan.....its really nice and thanx god that i know NOW that also nice girls exist in down under;-) also nice was the short cut on Comfy numb under big dave , i think it was in Budokan,tokyo. all the best to you shine on" "tom"
From the movie, Keyboardist Jon and Singer Rachel Ham-it-up! "Bob, As I said when we corresponded briefly when I ordered the movie, you are to be envied. I don't know how many copies of the movie you'll sell, but it is well worth the money for any person interested in Pink Floyd, or any touring production for that matter. I hope you do well with the movie, you deserve to. Thanks again" "Bill Rufenacht"
"Hey Bobby, I finally got time to watch your movie; It was fun, It was Cool and I really felt like I got to know you guys. And as a Pro-Photographer speaking, your filming was not to shabby! Pink Floyd is still my all-time favorite. I appreciate what you have done. Thanks much and get in touch,. ""Tom Welsh"
"I got the tape! It's great! I love it! Really! What a COOL job! Travelling with Pink Floyd and that fun crew, visiting other countries and interesting cities, meeting people, making friends, attending to every PF concert,... having fun all the time and getting paid for it, WOW! How do you get to manage all those keys? Don't you get lost sometimes? I feel like watching it over and over. I noticed you wearing a "Rock In Rio" T-shirt. I had one like that too :) How can I thank you? Your movie makes me feel close to them..""Katia"
From the movie, Ol' Hot-Foot Him-self does a little solo. 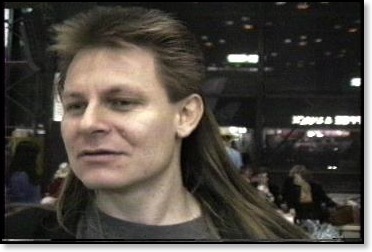 "Now I really want to be a Pink Floyd Roadie. Wish I had a sore throat. Thanks for the tape, and maybe you will let me know if there will be Yet Another Movie. Till yer lookin' for a roading. I'ze be waitin'" "Dan the Man"
"Good job, man. I've always wanted to see how they put the stage and everything together. Thanks especially for zooming in on all of Dave's guitar effects pedals cause I have been trying for some time now to achieve that Gilmour-tone and now know what he uses! If you ever work with them again, make another movie! Oh by the way, Pete should have gone for that blonde chick in the leather!" 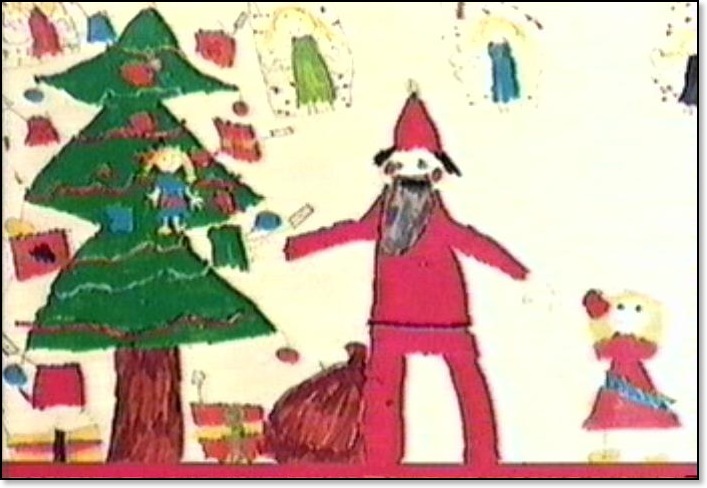 Jerry Dunbar"
From the movie: Here we have a Christmas Card created by one of David Gilmour's children sent to me by Mr. Gilmour . 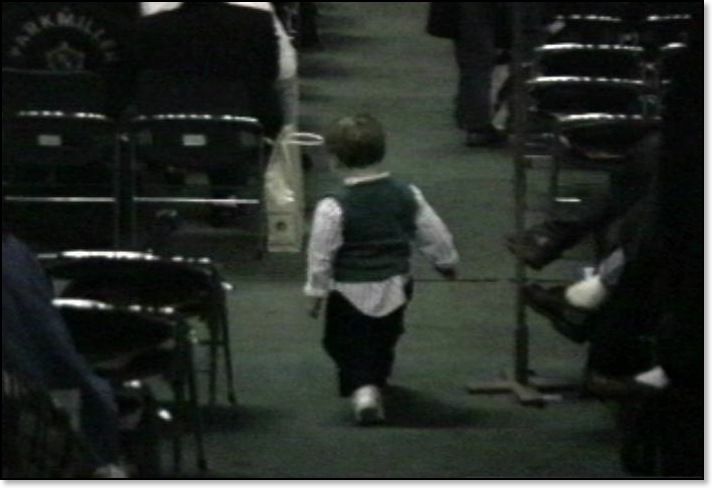 From the movie:Speaking of David Gilmour's children, here is Dave's son Mathew in Japan doing the "Pre-Show Prowl. " 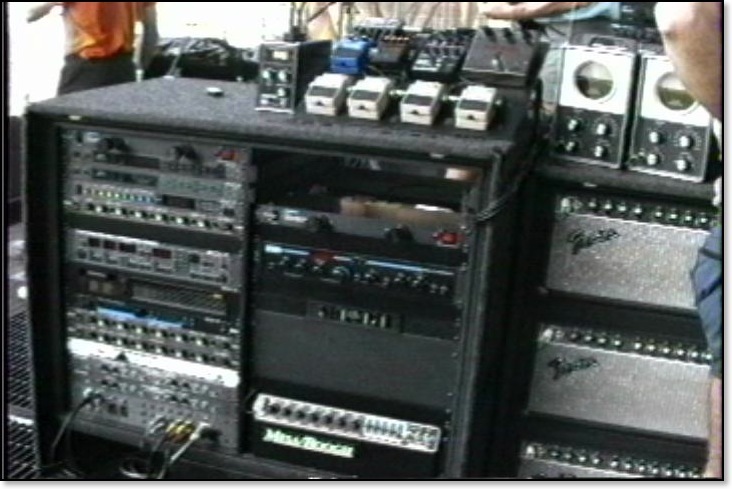 From the movie: Here is a shot of Mr. Gilmour's massive guitar rig. 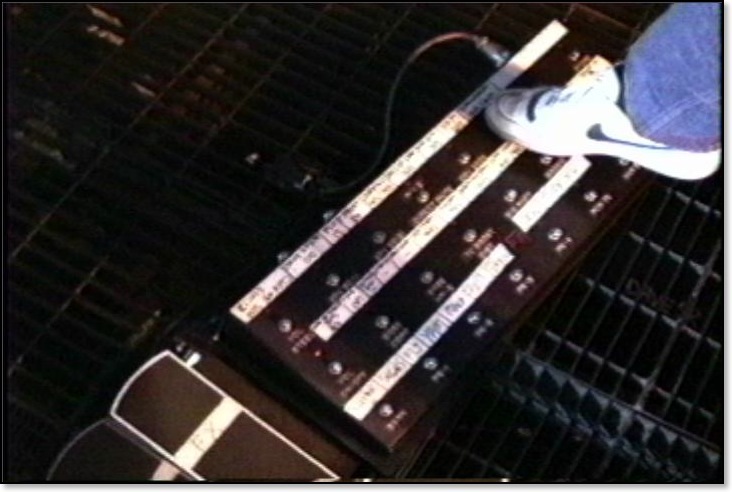 From the movie: Mr. Phil Taylor, who cares for Mr. Gilmour's guitars, shows me how the pedal board works. 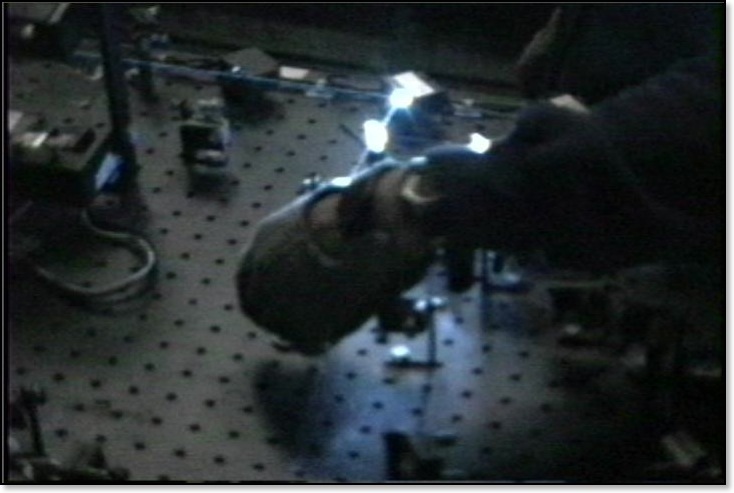 From the movie: Mark works with mirrors to direct the laser-beam on his Laser Table. I had a huge party last night and we watched your video and and the "dark side of oz". Eveybody loved your video! !.....They all said, "wow !! , i wish i could have been there !!" UNBELIEVABLE! Ya don't see THAT in recording school! Nice job, dude! WOW! What a trip. Very good ebay seller. Thanks Bob love the tape and that was ffffaaaassssttttt delivery thanks!!! FAST SHIPPING , VERY COOL VIDEO !! AN ASSET TO E-BAY ,THANKS!!!! AWESOME!!!!! !EVERY FLOYD FAN SHOULD HAVE THIS!!!! Very nice tape, a must for any true Floyd collector. Thanks!!!! Fan-freakin'-tastic! great deal- great shipping. Superb...I recommend all aspiring engineers see this video A+++++++++!!!! Fantastic!! Unbelievably Fast Service!!! Great communication!!! Tape ROCKS!!!!! Love it! Want more like this movie. Great Film! Movie arrived EARLIER then expected! Great picture quality/sound*if you don't own this tape, you're not a Floyd fan!! Fast shipping,good quality,good behind the scenes on PF,and girls,girls,girls ! Great seller. I can't stop watching the tape!!!! Thanks a lot Bob!!!!! Your prompt and make a great documentary..from a floyd-head..I'm jealous! UP CLOSE & IN YER FACE FOOTAGE! !true scenery inside the scenery!! RITEonBOB! BOB IS MY HERO!!! ITEM IS GREAT!!! VERY FAST SHIPPING!!! THANKS BOB! 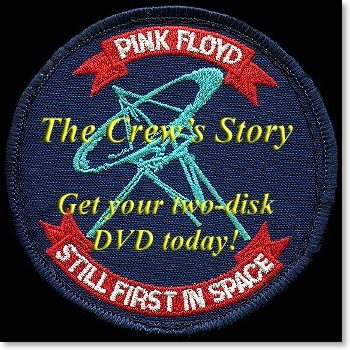 cool video - fast shipping - a must for the PINK FLOYD fan! DUDE!!! Got the tape the DAY I send the check. Wow!! practically got here before I ordered it! Recommended highly!! Cool video-fast shipping-good communication- A+ transaction!thanks Bobby!! Fast Service... Great Communications... OUTSTANDING Product... Thanks..
great, rare view into the måchine ; ) thanks for the fast easy transaction ! we're not worthy! we're not worthy! much fun had by all... Thanks, Bob! Enjoyed the movie! Made me feel like we were actually there! Thanks. Great job Bob!! You captured it! If you're a Pink Floyd fan, order this today! Fast Shipment! Incredible Tape! I envy you BOB!! Can I put you on my resume? Video got here in a hurry! Cool behind the scenes look at PF! I really enjoyed the video, and I even watched the DSOT video like you suggested in the approriate spot. That really enhanced my appreciation for what you witnessed at all of these shows. The sound was always excellent at any of the shows I saw especially on that tour at Chicago (9/26/87) and in Phoenix (4/25/88). Again, thanks for the video and keep up the good work!!!! "Shine on you crazy diamond."